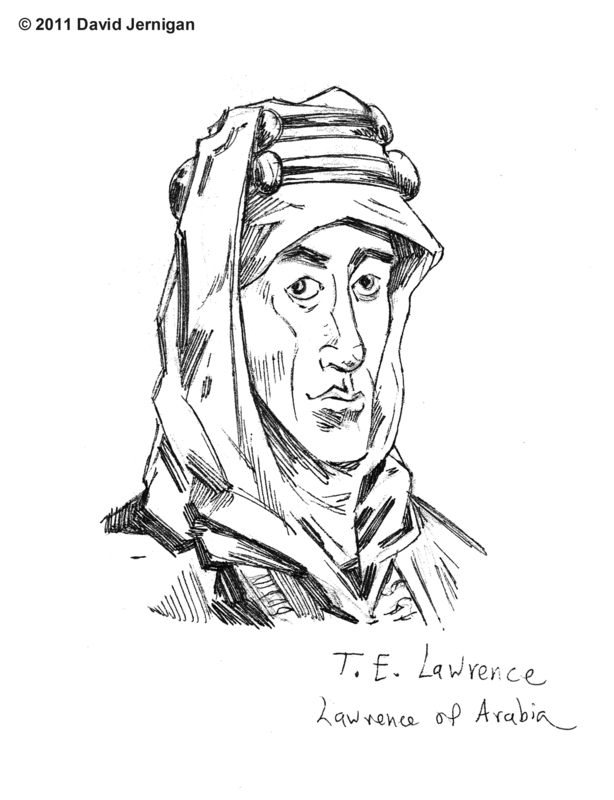 This is my sketch of the great Thomas Edward Lawrence better known as Lawrence of Arabia. T.E. Lawrence was regarded as one of the last true heroes of the British Empire by Winston Churchill (According to the Rise and Fall of the British Empire by Lawrence James). Lawrence of Arabia helped topple the Ottoman Empire and had a profound effect on the making of the modern Middle East. When I was a kid, I had a great book called, Lawrence of Arabia. 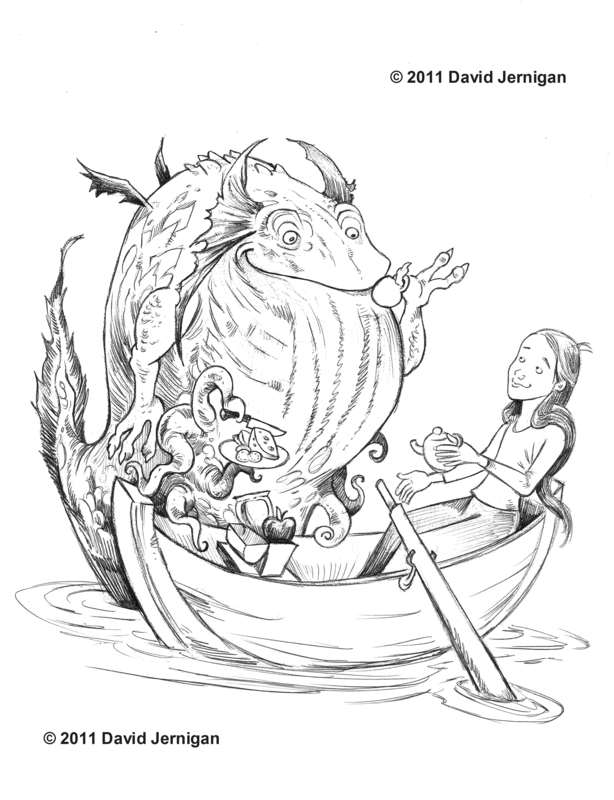 The book has impressive loose line illustrations by illustrator Gil Walker. The book is still proudly sitting on my book shelf. 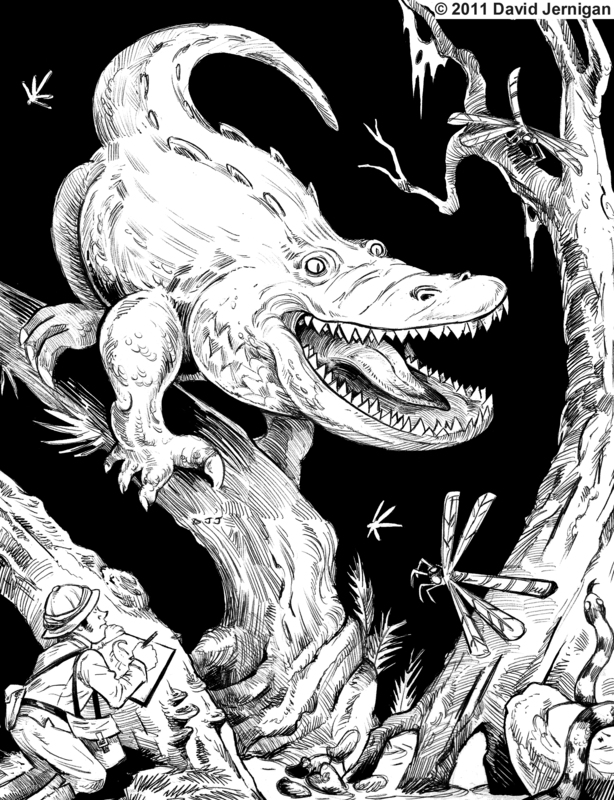 Alligator monster encountered during a zoological survey. This drawing came to me after I had started a sketch of an alligator monster. I imagined a man in charge of a zoological survey of an island similar to Skull Island from King Kong (If you don’t see the poor fellow, just look at the bottom corner of the picture). I dare say, to find a man’s true character, one should put him in charge of a zoological survey of Skull Island. Dangerous work, that goes without saying. I will never grow tired of drawing monsters, whimsical or frightening. 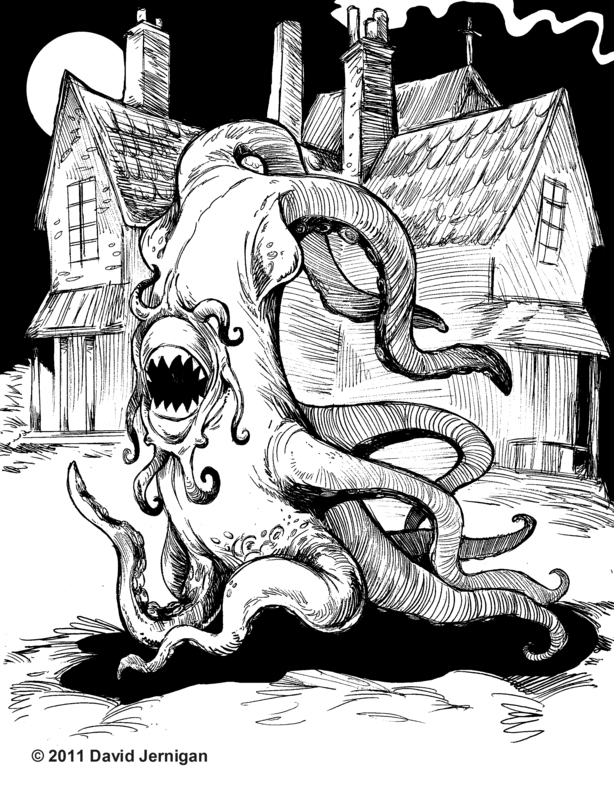 This is an example of a whimsical monster as compared to some of the terrifying monsters I have posted. I changed a few aspects of the drawing when I finished the illustration. I thought the monster should be friendlier looking and ended up changing the creature’s face. 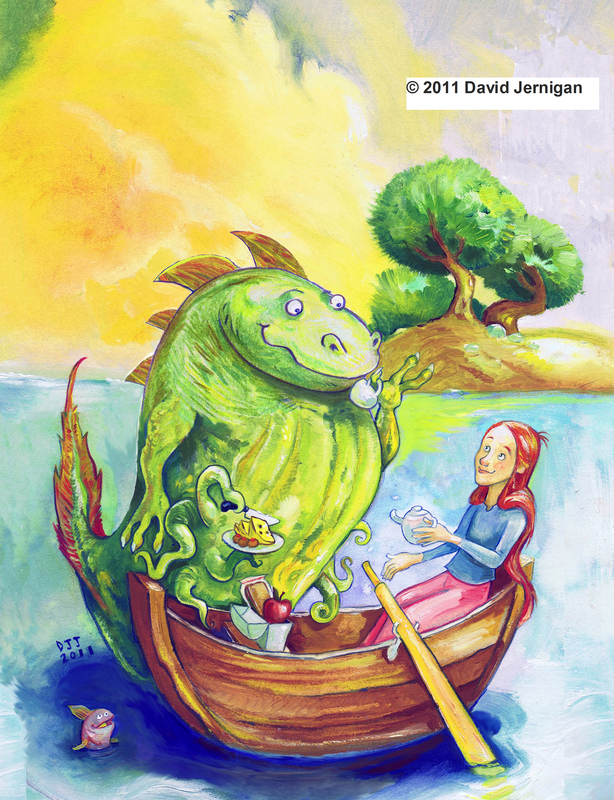 Friendly or not, that girl is taking a big risk having tea with a sea monster! I was stuck in an almost two hour line at the College of Southern Nevada. 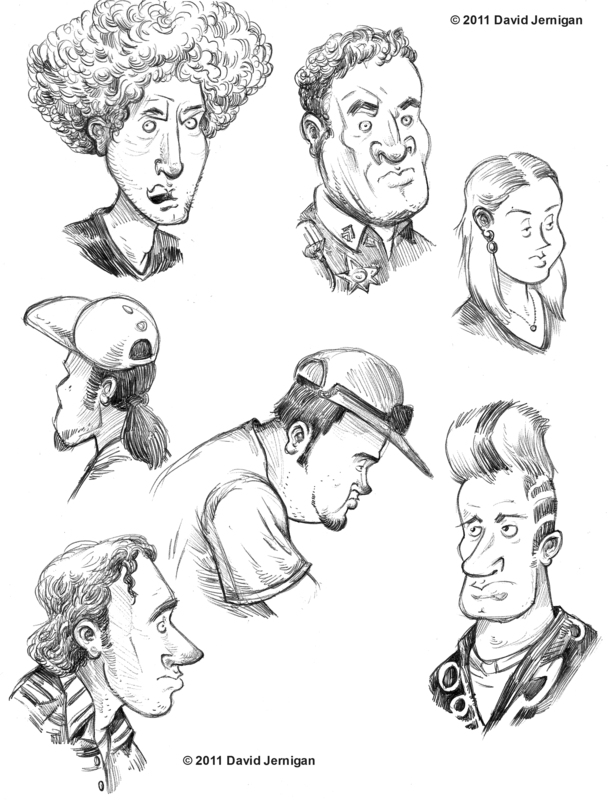 Requesting paperwork is never a pleasant way to spend your time, so I sketched the heads of some of the poor souls trapped in line with me. No one seemed to be smiling after the first hour had passed. I had plenty of time while waiting in line to question my decision to take a post-bachelors-post-post bachelors-post-masters class at CSN. This is a drawing of a scary aquatic looking monster out and about on land. Looks like something that crawled out of one of H. P. Lovecraft’s stories. It also looks like a great find for an all you can eat sushi restaurant. However, this piece of sushi would put up a good fight. 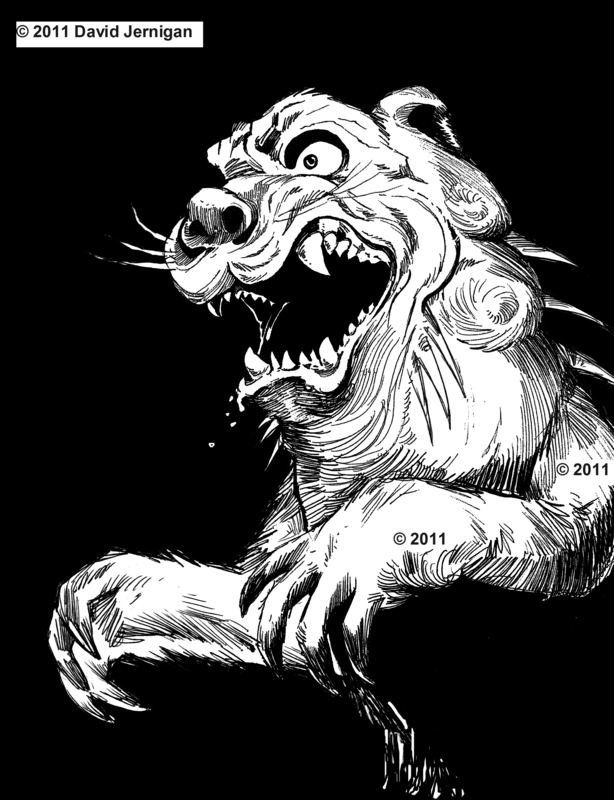 This is my interpretation of the legendary Chupacabra of cryptozoology renown. The school where I teach art has a predominantly Hispanic population. My students occasionally mention the deadly and mysterious Chupacabra. This creature is supposedly the size of a small bear, with a row of spines reaching from the neck to the base of the tail. My students talk about the mythical creature as a sort of boogeyman. 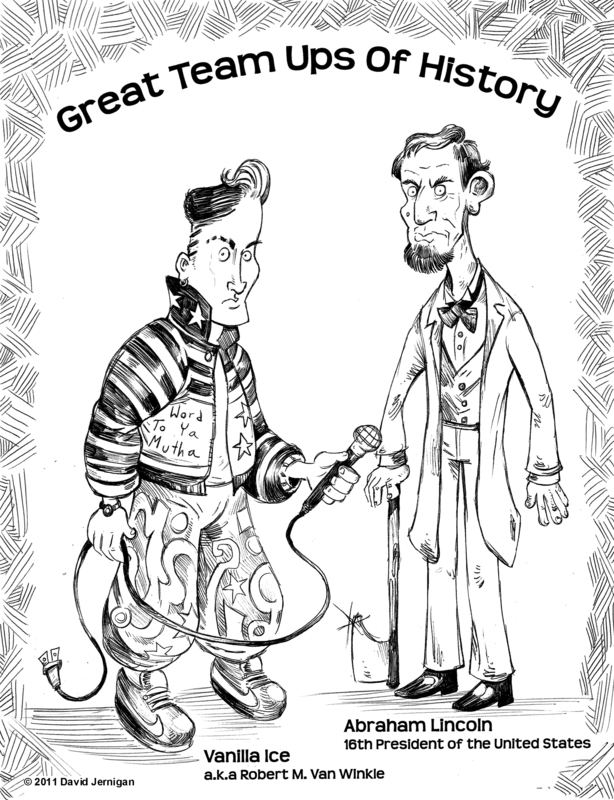 Abraham Lincoln and Vanilla Ice, teaming up at last! What if great historical figures could team up to fight crime, just like comic book super heroes do… what if? I give you, Abraham Lincoln and Vanilla Ice, teaming up at last! What do these two men share in common you may ask? Well, not much. One freed the slaves the other stared in Cool As Ice an improbable masterpiece; a film where everything has that amazing quality of fitting together. They are both great Americans…really only one is a great American. I will leave it to you to decide which one.